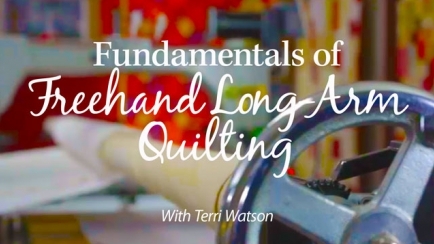 Terri discovered quilting in 1989 when, interestingly enough, she was picking up cross-stitch supplies at a local craft store. She was intrigued by Eleanor Burns' book Quilt in a Day, and ended up purchasing the book, fabric and a rotary cutter that day. In 2004, she purchased a Gammill long-arm quilting system. Today, Terri runs her own business quilting for others. Terri's business is thriving -- she currently quilts between 150 and 200 quilts per year! See more of her work at www.ThreadTales.wordpress.com.